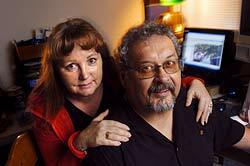 Between the two of them, Chuck and Dawn Livingston can recall every detail. They laugh and smile and politely interrupt each other when they tell the story of their online courtship. He remembers the dates. She remembers how she felt. They talk in the living room of their Roseville apartment. Their wedding photos are prominently displayed. Looking back, it was a leap of faith, they say. Six and a half years ago, both recovering from divorces, they each turned to an online dating service for members of The Church of Jesus Christ of Latter-day Saints, one of a growing number of faith-based services. "We connected right away - and we had the same beliefs," says Chuck Livingston. In Dawn, he met his soulmate. "We were both looking for the same thing." Namely, marriage. The two have been married six years and have become, among their friends and acquaintances, the poster couple for faith-based online dating. In recent months, many have turned to online dating services geared specifically to members of religious groups. There's one for nearly everyone - Catholics seeking Catholics, Buddhists searching for fellow believers, Orthodox Jews looking for spouses. The services that target the single and the faithful are different from traditional online dating services. Users fill out lengthy questionnaires about their spirituality - not their appearance. Many, like the Livingstons, are more mature and have been divorced. And unlike traditional sites where the goal is to get a date, a lot of those who use and run faith-based online services say they have more lasting goals. "We make no bones about it that we want people to find their spouses," says Marc Goldman, founder of SawYouAtSinai.com, which targets Jewish singles. The site has matchmakers who study the profiles of the users and match them to profiles they think are appropriate. About 8,000 people are using the service, which started in November 2003. More than 20 couples have married. Marriage is the goal for many Muslim sites. Rahmed Ali of Sacramento has signed up at several, looking for a wife who shares his beliefs and values. "So far, I haven't had any luck ... but I like the idea of finding someone this way. You know where the other person stands." Not everyone has had good online experiences. Cathy Patrick of Folsom went out with a man she met on a Catholic site for singles. "He was more religious than I am. .... I felt uncomfortable with his references to the Virgin Mary during our conversation." On some sites, users can specify the degree of faith they are looking for in a partner. For $29.95 for one month, users of Soulmatch can say, for example, which faith group - if any - they prefer. "We don't assume Catholics want to only meet Catholics," says Steve Waldman, CEO of Beliefnet, the Web site devoted to spiritual issues that owns Soulmatch. "The degree of spirituality is more important to a lot of people." Soulmatch was launched last September. So far, it has 100,000 members of all faiths. Unlike other faith-based dating services, the company's goal is not necessarily marriage. "We're agnostic on that," Waldman says. Waldman says many of their users are older and nearly half of them are divorced. "It makes sense. ... When you're 19 you may not be thinking about faith and values so much," he says. "When you're older, you want to cut to the chase and focus on what's important." Beliefnet got into the online dating business after company officials noticed that their singles message boards were their busiest. The CEO is not surprised. According to Waldman, studies show that 83 percent of Americans say religion is important to them. Yet, traditional online services have ignored the faith factor. He calls it their "big blind spot." "It stands to reason that if people say their faith is important to them, then it's going to be important to them when they're looking for a partner," says Waldman. For many of the sites, safety is also an issue. At LDSpromise. com, a popular LDS site, members take a compatibility test that takes about 1 1/2 hours to complete. A user interested in meeting another person must go through several steps. The site also has several cautionary statements that are clear about when and how people should meet. All of this makes it difficult for potential predators, according to the company's founder. "LDSpromise.com attempts to solve this basic flaw," says Lynn Scoresby. Linda Welch-Hicks, 56, who lives in the Sacramento area, has used several LDS sites. She says she is cautious about whom she writes to. And she is clear about what she wants - marriage. "I don't want to be someone's pen pal. I want to get married." Recently, Hicks met a man from Utah online. They've hit it off. This weekend - Valentine's weekend - he is flying her to Salt Lake City for a three-day date, that includes stops at the Temple Square, the college where he works and church on Sunday morning. She is not nervous about spending so much time with someone she's never met. "We get along really well on the phone, and I can tell he's really nice." The best part, she say, is that because they have the same beliefs, they also have the same expectations. "It's something we've discussed." Dawn Livingston decided to discuss her history when she sat down to write her profile six and half years ago. She wanted to start any potential relationship on the right foot. So she was upfront. She was divorced with four kids. She took care of her sick mother who lived with her, she wrote. "I had a lot of baggage," says Livingston, who works as an instructional aide in the San Juan Unified School District. "A lot of men would have looked at that and run. " Chuck Livingston liked what he saw. Instead of running, he e-mailed. "I loved that she didn't try to hide who she was," says Livingston, who runs a wedding photography business. Finally, anxious to meet him, Dawn suggested he take her to a movie. They were engaged a month later. Within six months, they were married. Now, sitting side by side at home, the two say their prayers have been answered. "I wouldn't have married again unless I was sure," says Dawn Livingston. The Bee's Jennifer Garza can be reached at (916) 321-1133 or at jgarza@sacbee.com.